Babes-in-arms are by turns delighted and mortified by its touch and feel. Toddlers barely able to walk can get a taste of what it means to make their mark on the world, implanting footprints in the ground, then admiring the impressions they have made. Five-year-olds can make a snowball in five seconds, and a snowman (or woman) in five minutes. Eight-year-olds can conduct whole street fighting wars, safe in the knowledge that the worst battle injury they are likely to sustain is a face full of icy powder. (Not fun, but hardly life-threatening.) 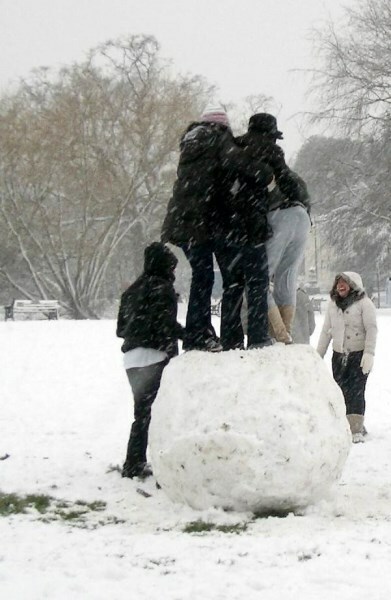 Teenagers can strut their stuff for hours building monstrously oversized snow boulders. Snow is easy to make stuff with, but it also offers real challenges. Building an igloo demands perseverance, practice and a degree of architectural flair. Yet snow is a forgiving substance: you would have to try very hard indeed to build anything that risked life or limb. I wonder how many children would trade all the toys and gadgets under their Christmas trees for a regular supply of construction-grade white stuff? That is why this winter, I hope you get the chance to appreciate that most creative, engaging and magical of loose materials, snow. 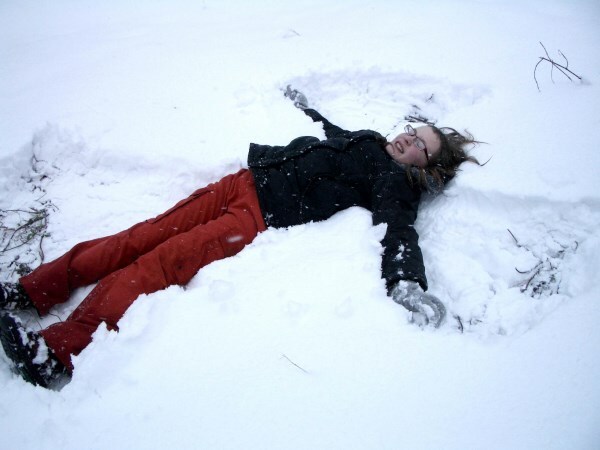 This entry was posted in Outdoor play, play and tagged Aldo van Eyck, loose part, play, snow. Bookmark the permalink. Thanks for a lovely seasonal post. I would love a white Christmas. Hi Tim, I totally agree there is something about snow as the ultimate play thing. We spent last winter living in Moscow, amid the worst winter in 100 years. Having come from a country where we hardly see snow, it was amazing. While there our kids would head outside in any weather, rugged up to the max, with nothing more than a $2 plastic disc and spend hours (or as long as I could handle watching in the cold) sliding down the snow covered mounds outside our apartment, throwing snowballs at each other, or making snow angels (amazing how they never tire of this simple activity…. ), or alternatively iceskating in the sports cage adjacent to our apartment as well. It never ceased to amaze me just how much enjoyment the snow brought all the kids of the neighbourhood as there were always plenty of them out there having a ball. Somehow a few feet of snow make the freezing cold weather of winter more bearable and enjoyable as opposed to cold and wet weather like we are now subjected to in Tokyo. Jane, Claire, Juliet, Tony – thanks for commenting, and glad you liked the piece. Good to hear that even in Moscow the novelty of snow does not wear off. . . . . and of course, it is only water, another essential loose parts material!